I love waffles, always have. If you stick pancakes or waffles in front of me, I’m always going to choose waffles. No contest. I just love the way those little squares catch all the melty buttery-syrupy goodness and make teeny tiny bathtubs, and they are soooo much crunchier than a pancake! Waffles were a fancy treat when I was growing up. My mum had the ol’ Sunbeam heart-shaped electric waffle iron that would screech like an electrocuted cockatiel when the waffles were cooked. She’d break out one of the handiest cookbook of 1990’s Australia, the Australian Women’s Weekly ‘Cooking Class Cookbook’ and flip straight to the ‘Batter’ chapter and make the fluffiest waffles. I emailed my mum for a copy of the aforementioned recipe, because my copy is currently sitting in storage in Melbourne, and after receiving a couple of photo’s, I gave it a few tweaks. Of course, it’s me… I had too. Both the original recipe and my tweakified one are simple, and it’s pretty much all pantry staple ingredients. As the heading says, I’ve used buttermilk in my version instead of regular milk. Why? Because it was in the fridge and it needed to be used up. And it gives the waffles a really nice tang, a little bit like yoghurt. Besides that, I swapped out butter for olive/vegetable oil, because I really couldn’t be bothered getting my microwave splattered in butter and having more dirty dishes, and I only cook with raw sugars (because I think they taste better) so I swapped out the white sugar for raw caster. Oh, and added in some vanilla. Nothing majorly changed, still really easy to cook with and easily obtainable from the local supermarket. Now, what’s the main difference between a pancake and a waffle? The egg whites! These little sacs of albumen get separated out from the yolks and have their own party with the electric beaters! Yay! Now, we are looking for stiff egg whites. How stiff? It needs to look like a pavlova sitting in a mixing bowl, that’s how stiff. If you aren’t sure, do the helmet test. That’s where you turn the bowl upside down above your head. If it falls on your hair, it’s not stiff enough. Please don’t actually sit the bowl on your head and let your hair touch the bowl!! I don’t know how many waffles this recipe makes. What are you talking about Mandi? You just made them! Well, I know how many I made, but I don’t know how many you will make. This batch of waffle batter makes 8 waffles in my Kenwood, but they are thick! I only eat 1 for brekkie. 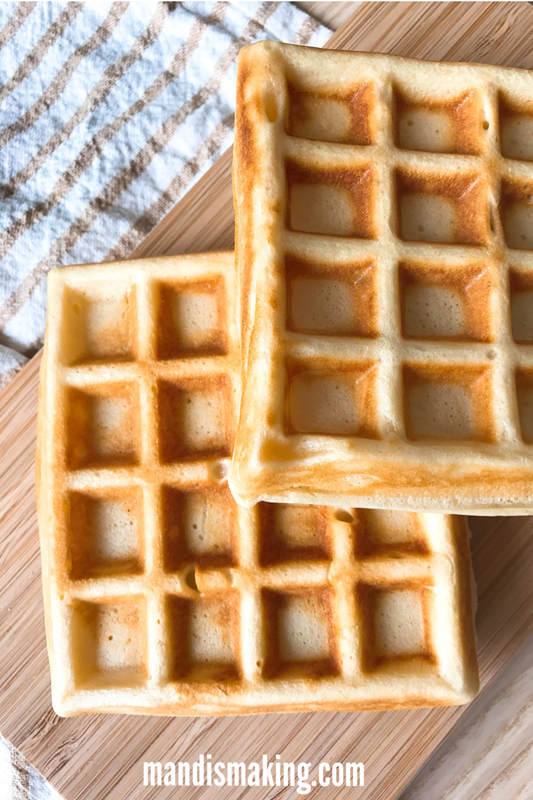 The original AWW recipe says that it makes 10 waffles in the large heart-shaped flat waffle maker. So depending on your iron, you could get 8-12 waffles from this mix. 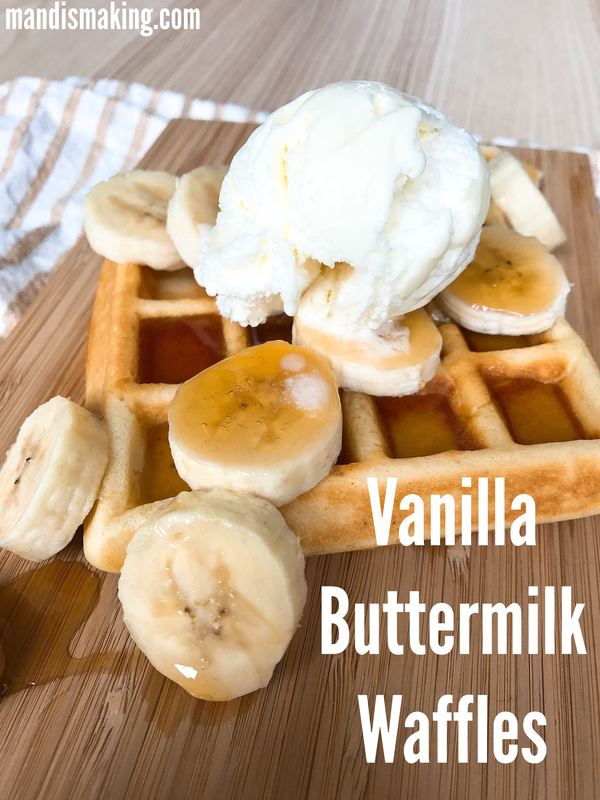 I adore waffles for brekkie, but they do make an awesome dessert too. In my pics I’ve smothered the waffles with sliced banana, vanilla ice cream, and of course, lashings of pure maple syrup. But my quick and easy go-to is to smear the top of a re-toasted waffle with cream cheese, and mop up a puddle of maple with it. Oh yeah, these freeze really well! I’m the only waffle eater in the house. CTO dislikes them (I know, right? ), and Miss G just nibbles them, so I package them up into ziplock bags of 2 and chuck ’em straight up in the freezer. I just pull a bag out the night before and stick it in the fridge to defrost overnight. In the morning, nice soft waffles ready for toasting! Whisk the egg yolks together with the buttermilk in a large mixing bowl. Add in dry ingredients, whisk until combined. Add oil, water and vanilla, set aside once mixed through. In a medium mixing bowl, beat the egg whites on high speed with an electric mixer until it looks like a meringue and firm. With a rubber spatula, fold the egg whites into the waffle batter. Cook according to your waffle iron manufacturers instructions, spray the iron with non-stick spray when required. Notes: You can use your family favourite milk if you don’t have or want to get buttermilk. I use eggs that weigh 70g with the shell on.